In 2015 Ireland became the “vanguard of social change”, according to New York Times and that has been the destination of a long journey that started in 1993, when homosexuality was decriminalised by the Oirechtas. 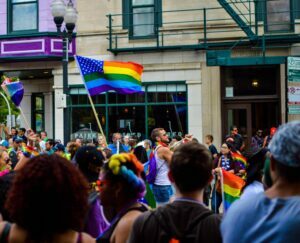 So why is LGBTQ still organizing Pride Events? They got marriage, civil equality and child adoption: Why should they organize this march? There are a lot of answers. First of all, just because everything is legalized does not mean that there will no longer be discrimination, or violence against the gay community; we live in a society that still needs to learn what love is, what sharing love between same-gendered people is, why it’s important to show that it’s the same love as a straight couple. Then because it’s necessary to demonstrate to other Countries, where civil rights are still a work in progress, that “it’s okay to be gay”, that nothing would change for non-gay people, because they already have all the rights Gay Communities are asking for. “We are Family” from Sister Sledge has been chosen as the slogan song of the Dublin Pride Parade 2018, an event that will take place this Saturday at 2pm from Stephens Green South. It may sound trivial, or a simple choice, since this song is known all over the world as a gay anthem, but maybe there’s more behind this decision. Being part of the gay community is something strange and sometimes it can become difficult too, because there are a lot of people with many ideas, beleifs, aims, and purposes. It’s not so easy as most people think to live in this way. Someone may think “you’re gay, hang out with people like yourself”. It’s not so easy, ‘cause there are a lot of differences and cultures in this world. You could think that the Spanish gay Community and the Canadian gay Community may share exactly the same values, but maybe they don’t. That’s why the Pride Festival so important. It’s a way to show the world that gay people exist, that they are happy, that it’s okay this way and all they have to do is deal with that and share this happiness, but it’s also a way to remind to the gay community that even in misunderstandings and differences, they’re all the same. They have the same worries, the same fights every day. But also the same Family. That’s why “We are Family” has been a proper choice for Dublin. Reminding people that they are a family is like remembering all the rules that you usually have at home with your dears. You may discuss and disagree with them, but at the end of the day you’ll go back to them. It’s the same. Well maybe we’ve got a little and colorful difference: in this case the house is all painted with rainbow colors, and it’s ready to say “welcome home” to everybody who needs a sweet word and a hug.